Spears Harambee Company in Wernersville, Pennsylvania offers traditional African masks that are ethically sourced. Traditionally, masks were often created for specific tribal ceremonies – however, today many are simply works of decorative art. The immaculate carving and details make the masks valuable art like our other artifacts and textiles, while conveying great cultural significance. 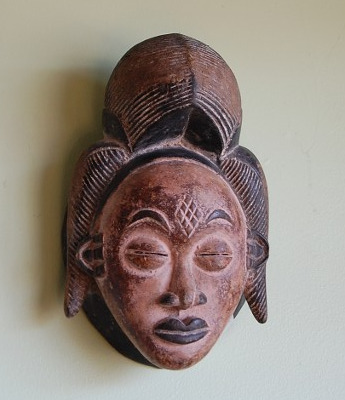 Convey the idealized beauty of Punu women with these masks made in Gabon. The elaborate high-domed hairstyles suggest that the wearer is wealthy as her hair has not been flattened by the need to carry goods. Traditionally, these masks would only be carved by Punu men. Now is your opportunity to share this tradition of storytelling through art in your home. Evoke the mystery of 20th century traditions of the Democratic Republic of Congo with masks used in ceremonial dance. These kifwebe bowl-shaped masks were worn with raffia costumes to represent spirits (kifwebe) as a connection between this world and the spirit world of the ancestors. Bring ancient celebrations to life with this headdress from the Bamana people in Mali. Dancers wore these figures on their heads as they celebrated agricultural ceremonies.